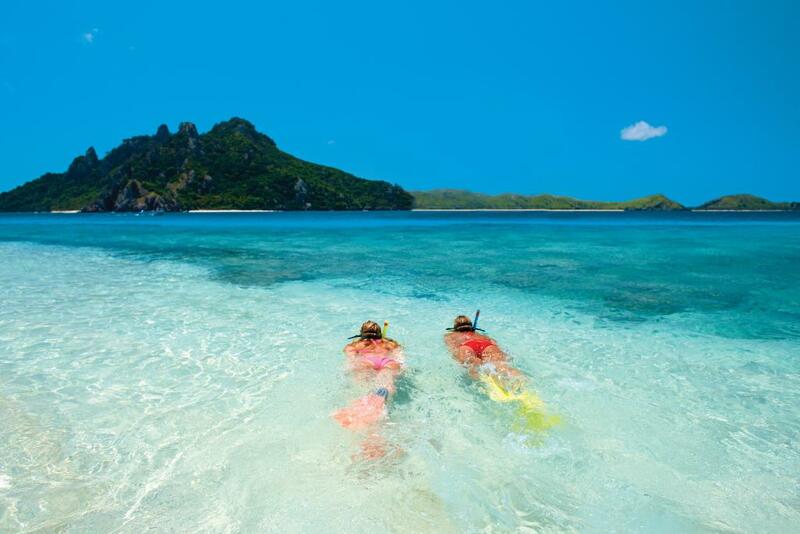 The beautiful Yasawa Islands are situated 40km north west from Nadi and have some of the most stunning beaches and lagoons in the South Pacific. 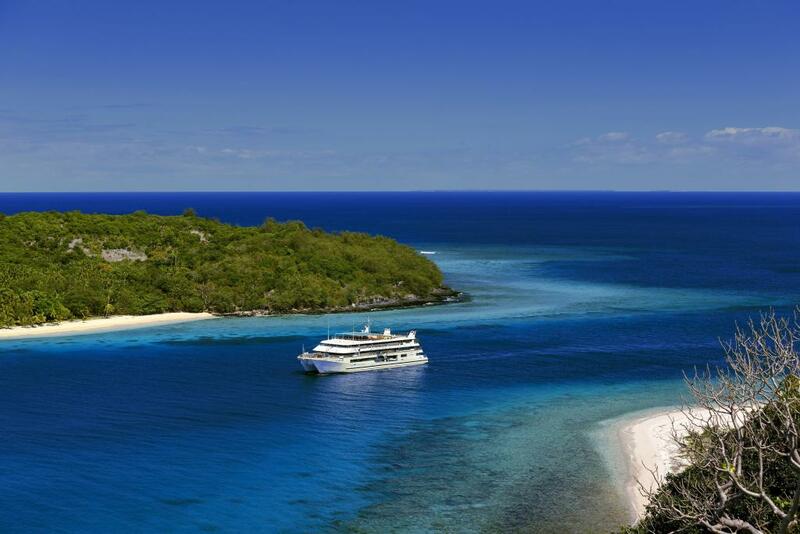 This can be yours to experience onboard Blue Lagoon Cruise's luxurious MV Fiji Princess, as you cruise the Yasawa Islands for 7 nights. 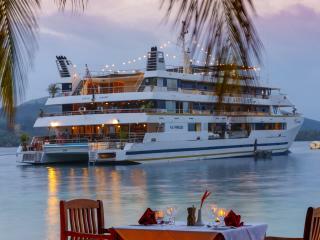 MV Fiji Princess is a mini cruiser with 34 spacious air conditioned suites, complete with a dining saloon, 2 cocktail bars and a beauty spa. 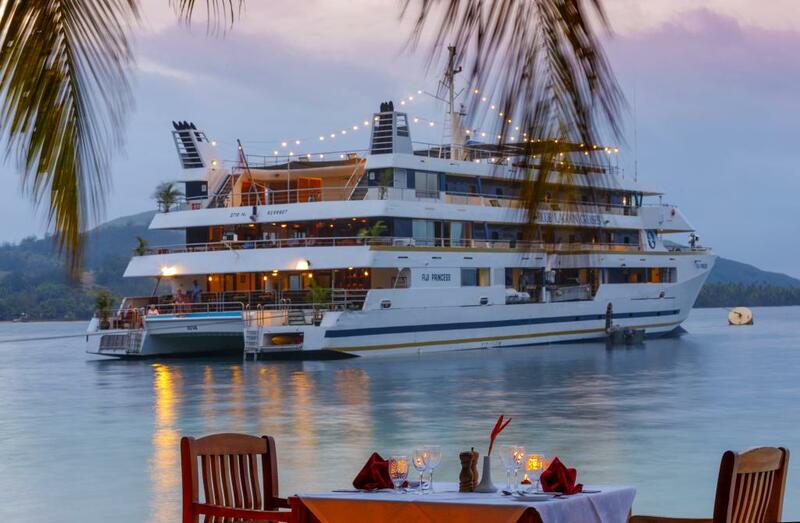 All meals and cruise activities are included in the price, allowing you to relax and enjoy boutique cruising at its best! 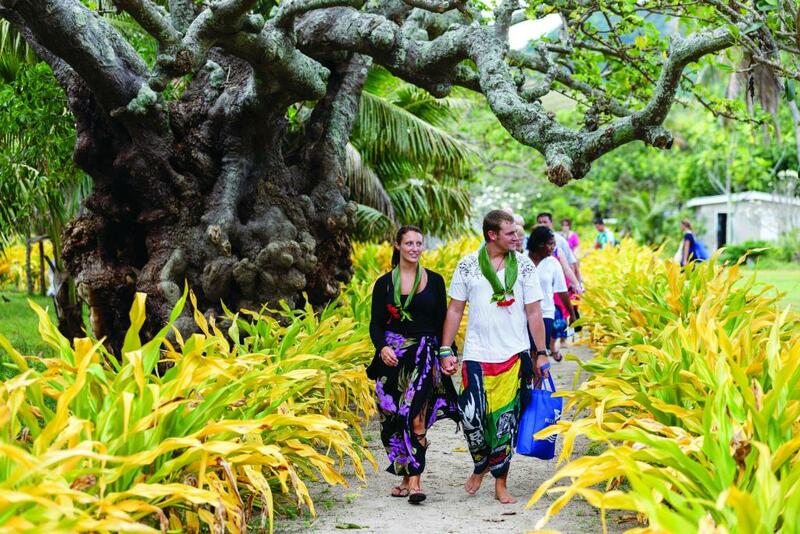 Visit a traditional Fijian Village and shell market, participate in a Yaqona (kava) ceremony while the villagers perform traditional dances, watch a basket weaving demonstration and experience life in a Fijian classroom. Your days will be filled with beautiful walks on white sandy beaches, swimming and snorkelling in crystal clear lagoons and relaxing under swaying palm trees. 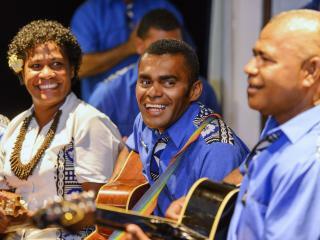 Nights will be filled with pre dinner cocktails, Island music, singing and dancing and enjoying traditionally prepared and cooked meals. 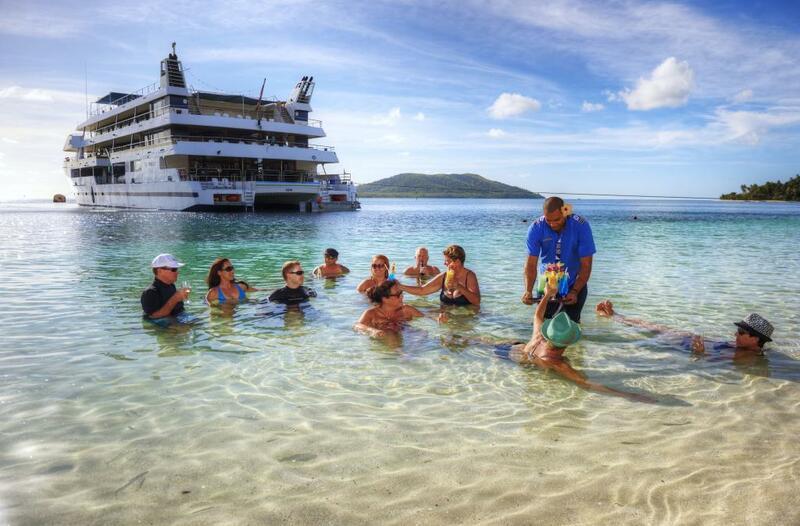 For your next romantic getaway or adventure holiday, why not experience this 7 Night Escape to Paradise Cruise that will leave you with wonderful memories of Fiji that will last a lifetime. 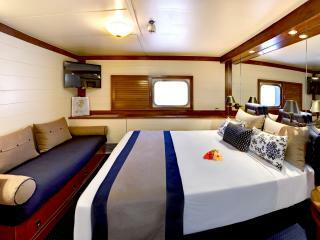 Orchid Deck: Orchid Deck cabins are located on middle and top level. 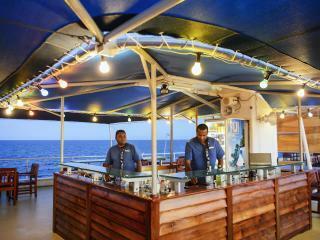 Orchid Deck will also include welcome fruit platter, daily stocked mini bar, Pure Fiji sun care pack, in-cabin Nespresso Pod coffee machine and tea making facilities. Maximum room capacity is 2 Adults & Children. 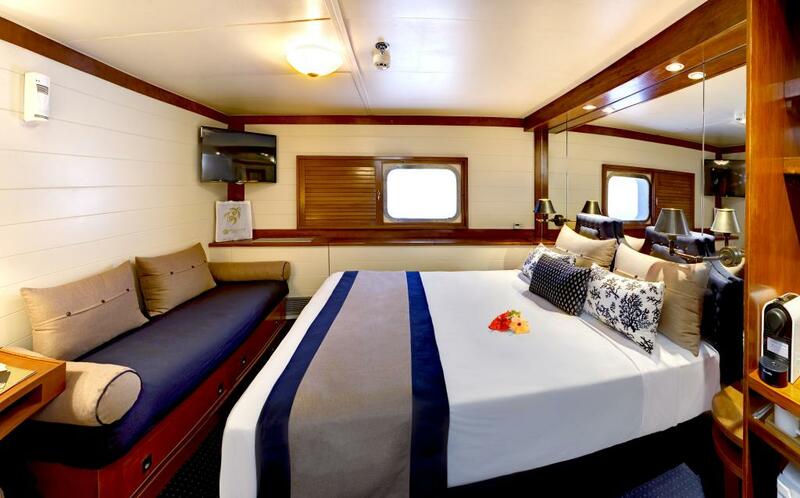 Hibiscus Deck: Cabins feature double or twin beds and are located on the lower level. Maximum room capacity is 2 Adults. 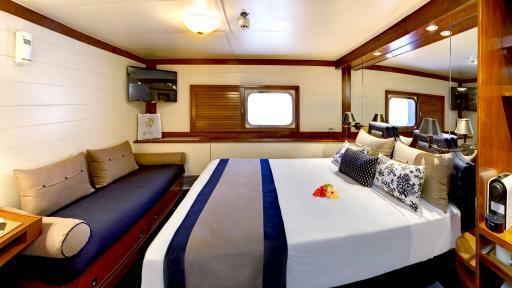 All Cabins Feature: air conditioning, a private ensuite, TV/DVD/audio system, vanity, hair dryer, soft towels and fragrant soaps. All are above the waterline and feature large windows. Family Cruises: On specified departure dates this cruise is open to families travelling with up to 2 children aged 0-13 years. The family cruise rate includes 2x cabins with the 2nd cabin valid for 2 children (0-13yrs) or 1 adult + 1 child (0-13yrs) sharing. The Chefs provide a variety of menus including a la carte meals, bbqs, smorgasbords and freshly made omelettes every morning. Special dietary requests can also be catered for, with prior notice. 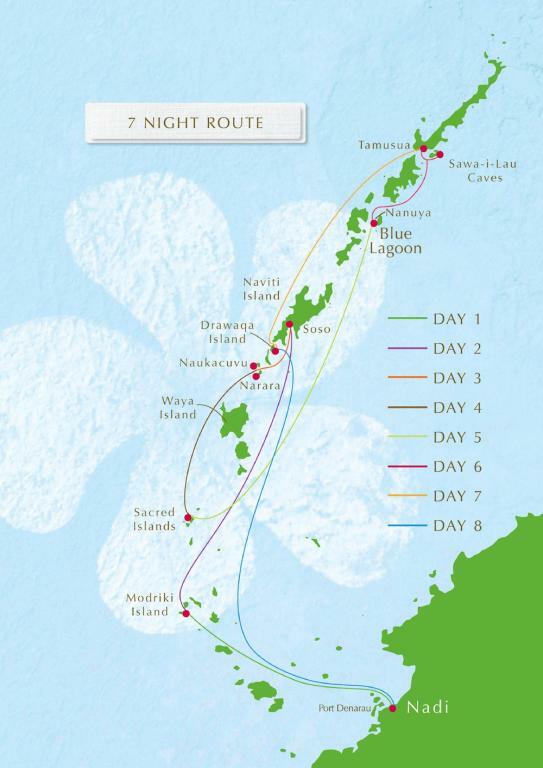 Day 1: Set sail this afternoon from Port Denarau to the outer Mamanucas. 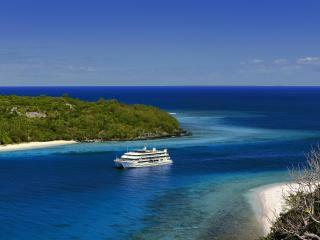 Enjoy afternoon tea before setting anchorage at Modriki Island, as seen in the Tom Hanks movie 'Castaway'. As the sun sets this evening, enjoy a few cocktails and canapes on the Sun Deck before attending the Captain's Welcome dinner accompanied by the ship's crew, singing and dancing the night away. 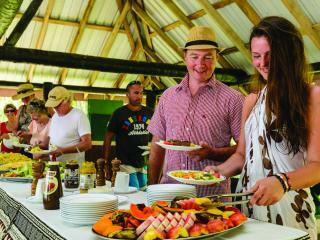 Day 2: Enjoy breakfast this morning while the vessel sets sail towards the southern Yasawa Islands. 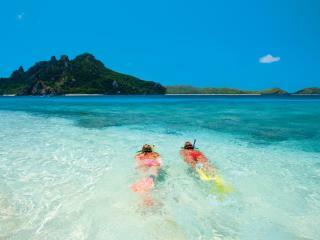 At a secret location, why not go snorkelling and swim with the Reef Sharks. 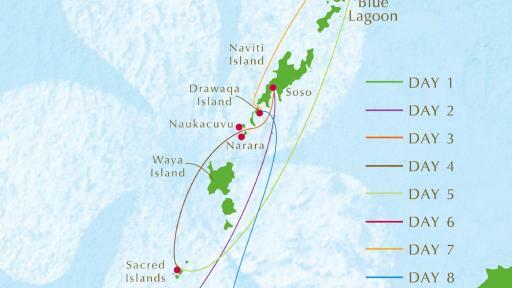 This afternoon after lunch, visit the chiefly village of Soso or perhaps go snorkelling, diving (optional extra) or kayaking, followed by a presentation about the local history of early Tasawan life. Enjoy evening cocktails before this evening's Indian themed 'Thali' buffet dinner and then dance the night away with Bollywood dancing including fancy dress and Bollywood movies. 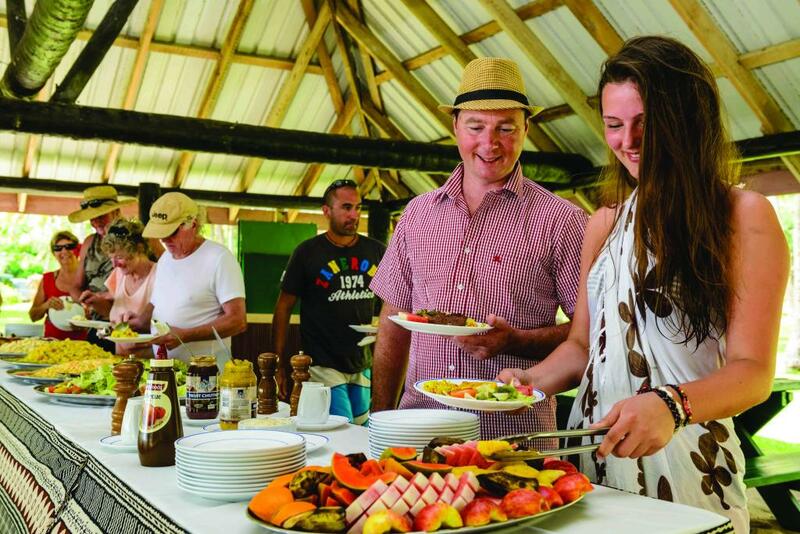 Day 3: This morning after breakfast, there is the opportunity to attend a Fijian village church service, or perhaps join the cooking class with the Chef preparing the traditional dish 'Kokoda'. 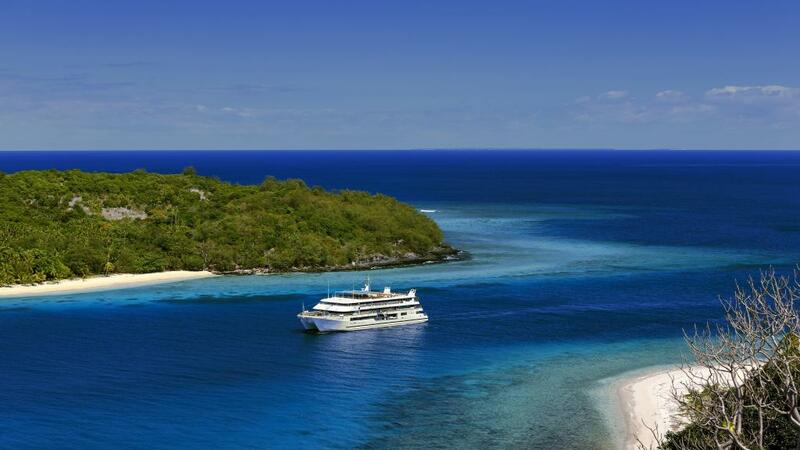 Enjoy the cruise to little Naukacuvu and Narara Islands and an afternoon of swimming and snorkelling after a traditional Sunday Roast lunch. Anchorage tonight is Naukacuvu Island. Sunset cocktails and canapes this evening are followed by tonight's Asian themed buffet dinner and a game of Bingo. 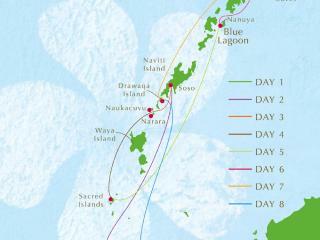 Day 4: Breakfast is at leisure this morning while cruising through reefs and into the central lagoon towards The Sacred Islands. 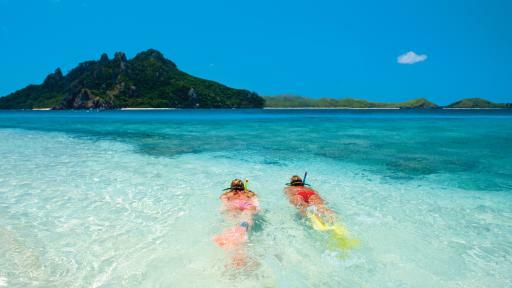 Stroll along the beautiful beaches or go for a paddle in the lagoon. 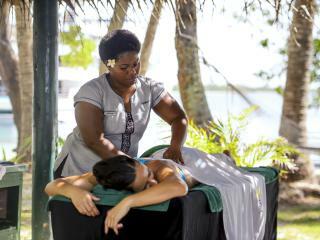 Enjoy a delicious picnic lunch ashore followed by an afternoon at leisure. Tonight, an a la carte menu is served at the Captain's Dinner accompanied by the ship's crew, singing and dancing the night away. Day 5: Breakfast at leisure this morning while cruising towards the beautiful and famous Blue Lagoon. Lunch is served on board as the crew dock along a private island beach. Spend the afternoon relaxing on sun loungers, playing a game of beach volleyball, taking a trip on a glass bottom boat, swimming or snorkelling. 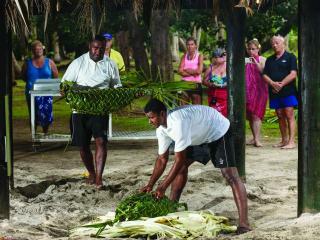 Why not watch a coconut demonstrations including fresh milk straight from the coconut. Enjoy canapes on the shore this evening before watching your traditional 'Lovo' meal being cooked in an underground pit. 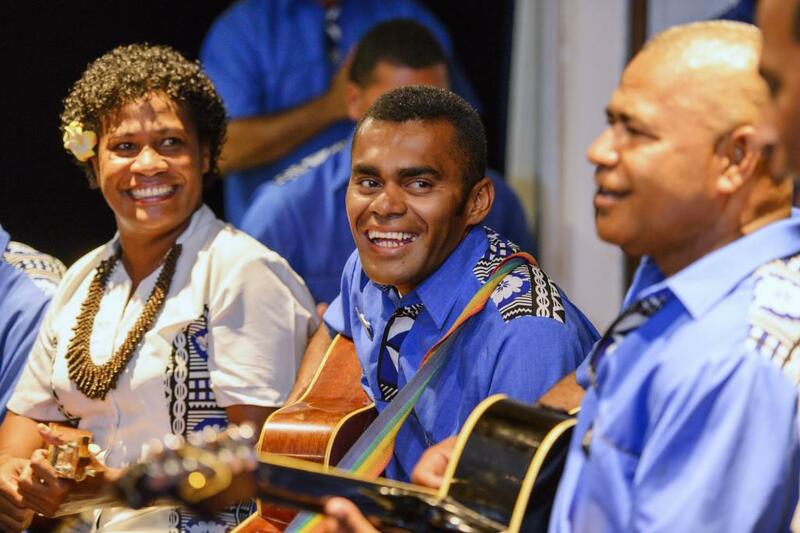 Sing and dance the night away with a group of local villagers. 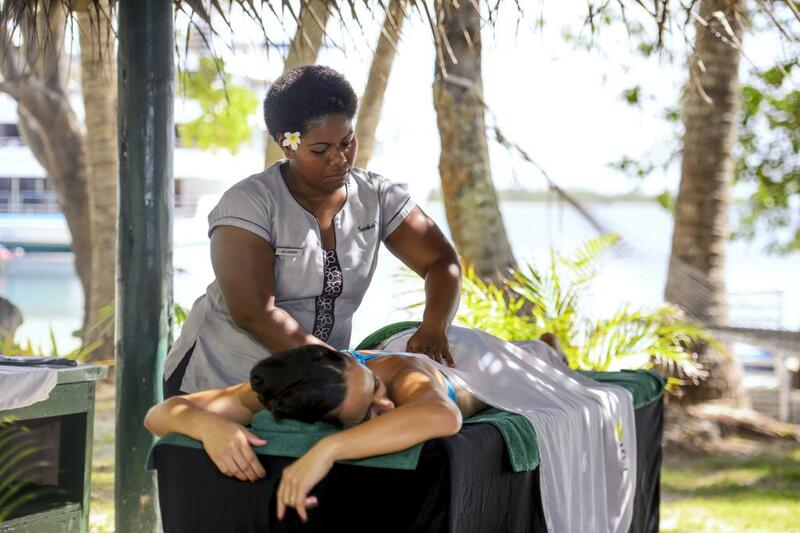 Day 6: After breakfast, most of your day will be at leisure on the island, where you can take a guided walk, learn the art of basket weaving and Fijian woodcarving or take a guided Reef Safari snorkelling trip. 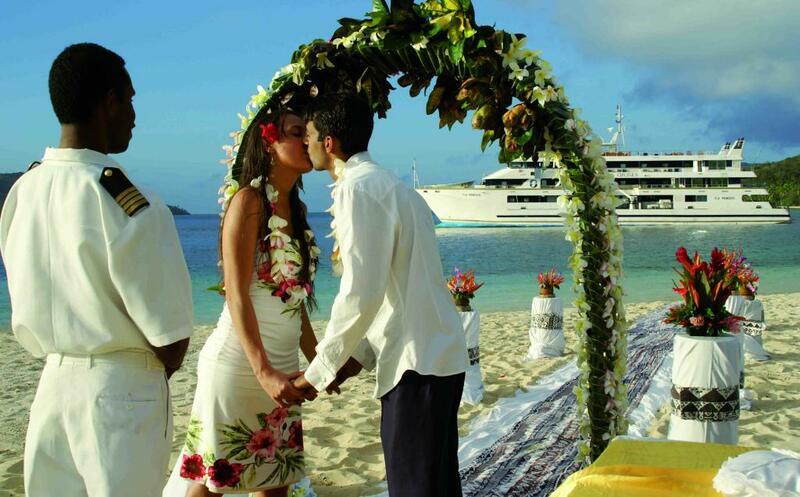 Afternoon Tea will be served while sailing towards the island of Sawa-i-Lau and upon arrival, partake in a private guided visit to the Sawa-i-Lau caves. 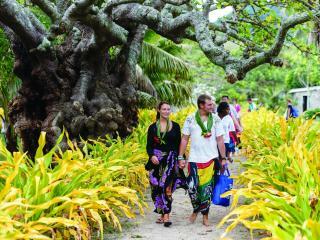 This evening is a visit to the village of Tamasua including a guided walk and a Fijian style feast freshly prepared by the village women. Back on the vessel, enjoy watching the classic movie, Blue Lagoon. Day 7: This morning, set sail for Drawaqa Island. 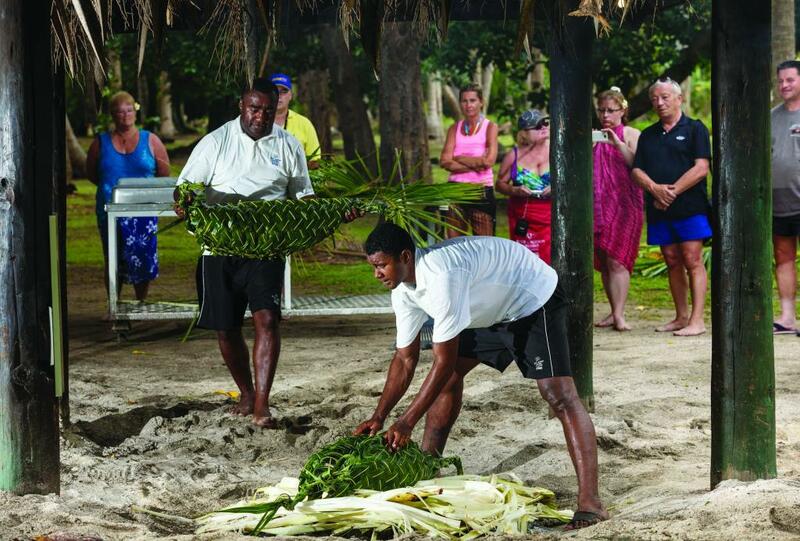 After a leisurely breakfast, a Marine Biologist will explain the marine life in the area and the work that the Vinaka Fiji Trust is providing. During May - October you have the opportunity to snorkel with the Manta Rays and from October - April, take a guided Reef Safari snorkelling tour. 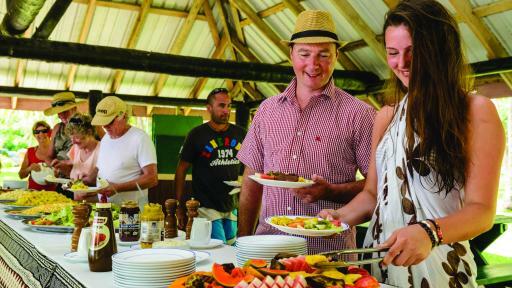 A barbeque dinner and Fiji style party under the stars has been arranged this evening as you celebrate your last night in the Yasawas. Day 8: An early breakfast on board this morning before cruising back to Port Denarau with a traditional Iselei farewell from the crew. 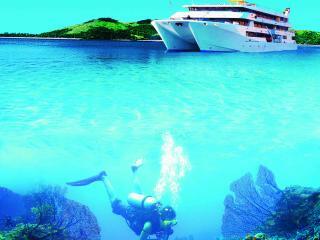 Diving: Can be arranged at check-in. Evidence of certification is required for anything other than an introductory dive. 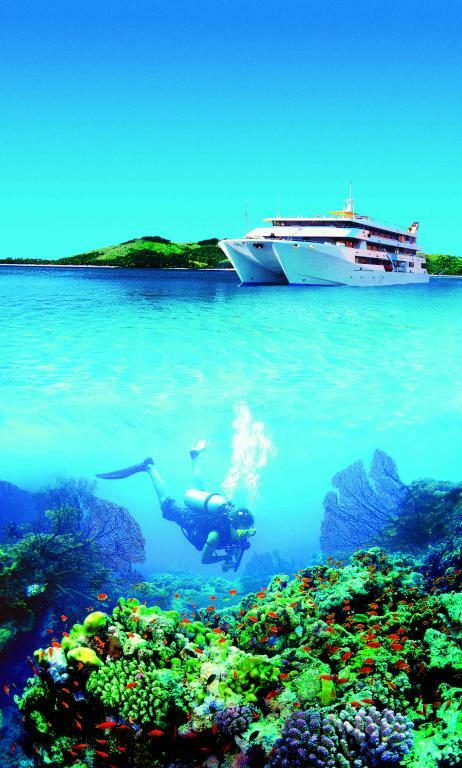 MV Fiji Princess is a 60 metre catamaran with 34 air-conditioned cabins. There are 4 deck levels with lounging areas spread throughout the wrap-around sundecks and accommodation on the first 3 decks. 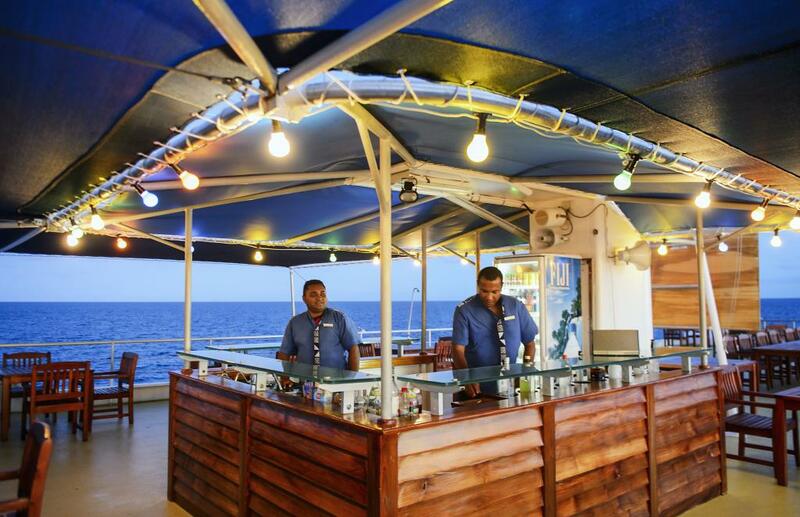 Facilities: Sundecks, lounge bar with DJ Station and wide screen TV, Barista coffee machine, Free WiFi available where reception allows, dining saloon, exercylces, swimming pool, beauty spa, boutique and guest laundry. Children: 14 years and over are welcome on this cruise year round. 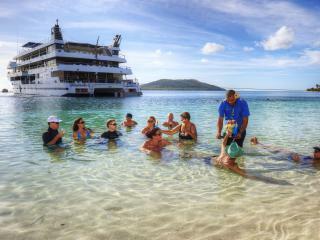 Children 0-13 years are welcome during Family Cruise dates only.